Its been a very long time since I posted anything, but I'm back! I survived sailing, so keeping with the mountain theme, as this is supposed to be a mountain blog here's a nice picture of me climbing ice today, in the Lakes. There's some really good conditions out there at the moment, we climbed about 150m of nice plasticky ice today. We were out yesterday and had a good day but the conditions are really variable even within each corrie so it takes a bit of local knowledge or good old poking about to find good climbing. Its well worth it though, its been cold for over a week, there is a lot of soft snow in the gullies that should survive a fair thaw so its looking good for a while yet. Its been a while! I've kind of been unplugged from the world for the last few weeks. At some point even I need a holiday, so I took a few weeks out to get some down time, to enjoy some of this summer for myself. 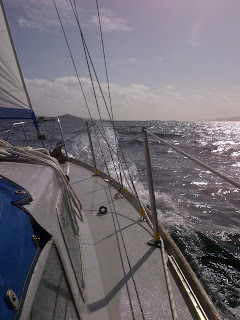 I spent a fair while up in Scotland sailing. 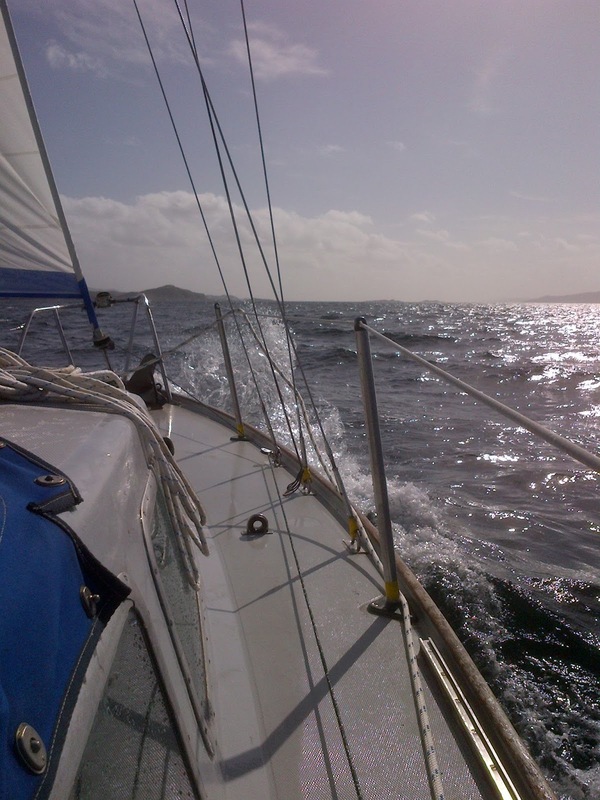 Its kind of life in slow motion, getting nowhere quickly but theres loads to do, fiddling about with sails and navigating. The winds where pretty crazy at times too and we spent more than our fair share of time stormbound, tucked away in little coves waiting for a fair tide and wind. Its nice to be totally out of touch for a while, the same reason I like spending time in the mountains. The fells are starting to change here now, theres a hint in the air of Autumn, a couple of colder mornings threatening frost, but the days are warm, if a bit wet. Still new seasons bring new challenges. I went potholing the other day, something I do quite a bit of through the Autumn. Its a great way to start building the fitness required to spend most of my time in the mountains in the harsh winter conditions. Back in April I started the year thinking that July, August and September should now be called 'The months formally known as Summer', but thankfully I was wrong, after last years 18 month autumn it was fairly well justified to think the crags might never properly dry again. 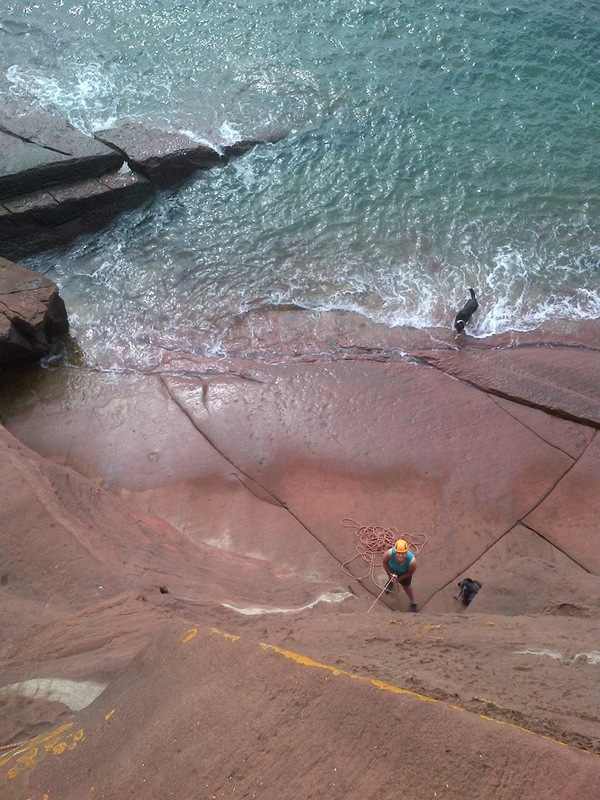 But they did, and climbers being climbers make the most of this. Not least the FRCC. 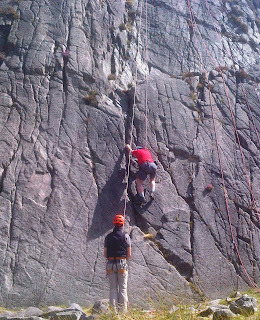 The Fell and Rock Climbing Club are a Lakeland institution, without their efforts climbing here would be very different. They produce the most comprehensive series of climbing guidebooks and hold archives of historic routes. 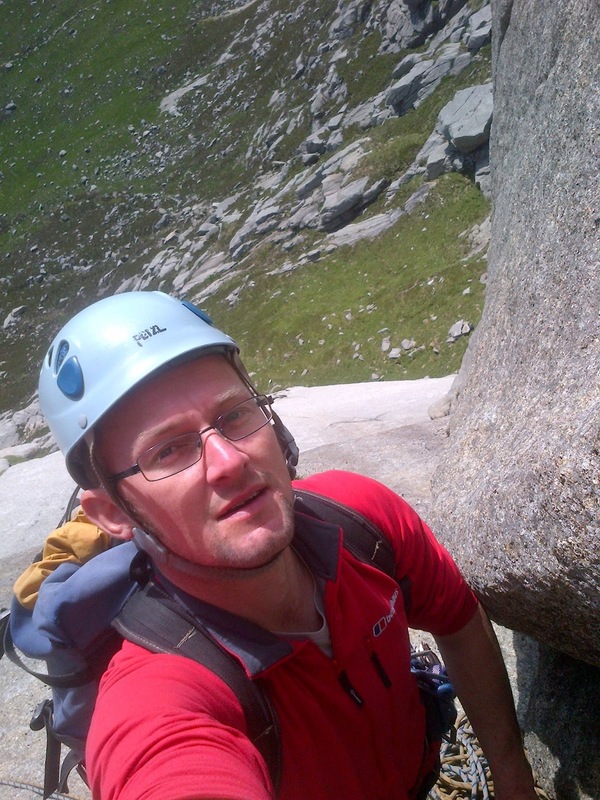 The good weather has seen a flurry of activity working towards producing the latest editions with previously unearthed crags being cleaned and new routes recorded. 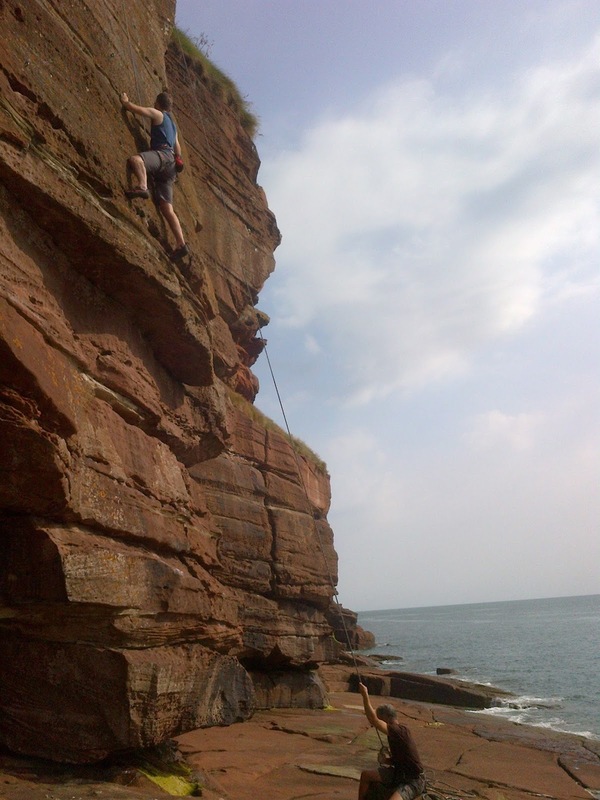 A new crag appeared on their website so I had to go and have a look, and found a few really nice little routes had recently had first ascents. The problem is if these new routes don't get climbed they become overgrown and unattractive. 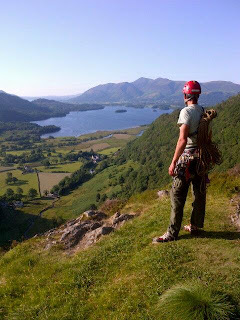 So next time you are out, consider one of these new venues, there are some cracking routes out there. 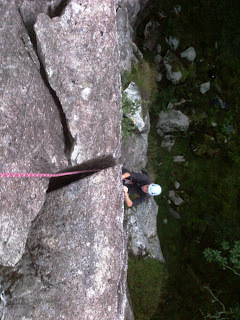 ﻿﻿﻿Over in Eskdale teaching climbing the other day on Brantrake crag. Strange name, but Brant is a fairly common name in upland areas. 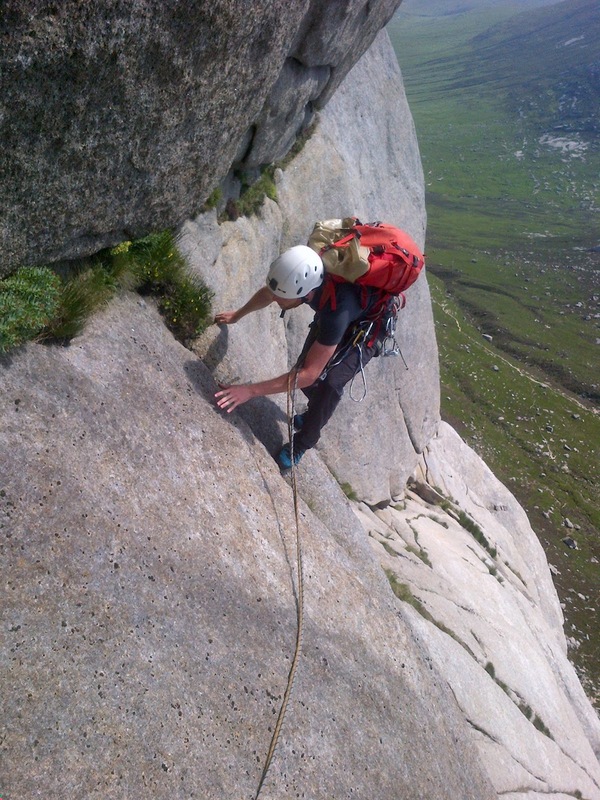 An old word derived from Norse meaning steep and rake refers to the angle[of the crag], but often in the mountains describes a grassy break running up through the crag, such as Jacks Rake on Pavey Arc. And the rain, thankfully has been showery, and the warm rock drys quickly. 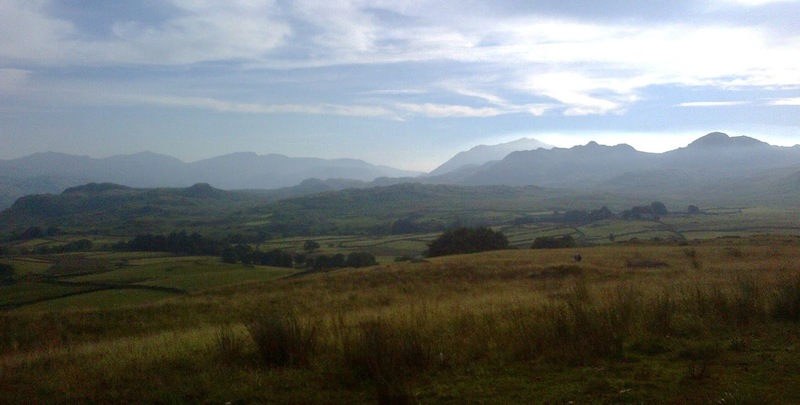 There is an awful lot of Norse influence in the place names of Cumbria and similar to the Gaelic names in Scotland, with a bit of knowledge, can give plenty of clues about the area you are visiting. So if yer on a brant crag, an it starts hossin' doon you'd better gan yam afer its te slape! 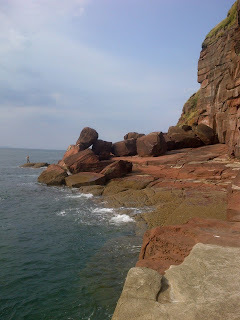 This was a new one for me, I knew St Bees crags where there but had never been down for a look. I nipped down and met Rob and his family and bagged a few routes. Its all bolted sport climbing on red sandstone, some of the best bouldering in the country is down here. Right by the sea, looking out to the Isle of Man its a pretty cool place to climb. A word of caution though, as with any sea cliff its prone to drastic change, the bolts we found where all in good nick but I removed a number of really dodgy bits of old tat from the crag. The climbing is pretty much like Gritstone, a mix of powerful steep moves in cracks and delicate slabs, great for training and hanging about by the sea. 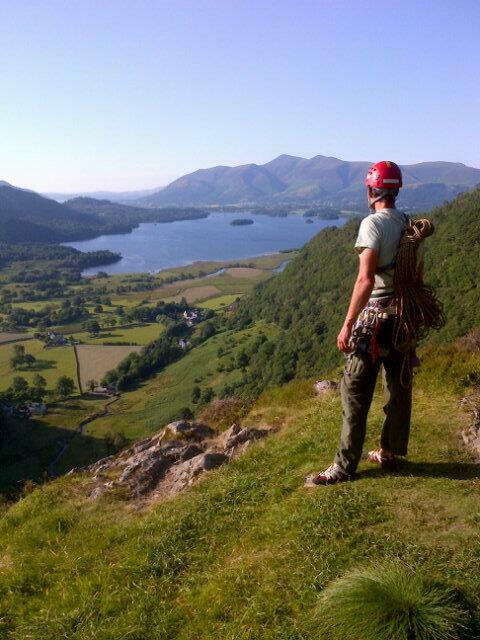 Its been well into the high 20s and low 30s all week up in the Lakes, even high on the fells. Its a really demanding environment and has taken a bit of extra thought for me to be able to perform properly and look after my clients. First off dehydration can be a real problem, I drink 2l before leaving, carry 3l in my bag for the day and drink another 2l when I get back down. The old Polar explorers manta of "ration sweat not water" goes a long way to helping make it last the day. Setting a realistic pace is super important if my clients are to enjoy the day, pounding uphill at Naismiths 5kph is not going to do anyone any good, a steady "Sherpa pace" is what's needed, breath in on one step and out on the other. Choosing shady approaches to crags help and climbing corners or chimney routes prevent the feet cooking in rock boots and avoid sunburn. Making sure folk eat too, its tempting not too but it wont help in the long run with the salts lost through exercise. 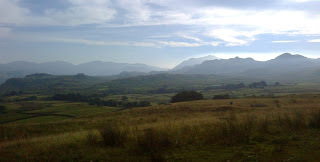 Its the longest warm spell I can remember in the Lakes, long may it continue but 5 degrees cooler would be nice. 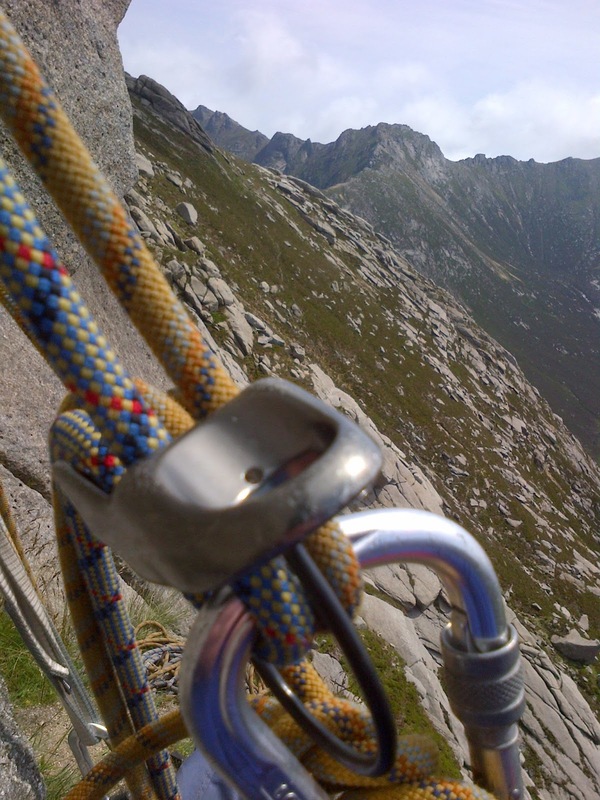 I've been up on Arran over the weekend with Andy, with aspirations of being a Mountain Instructor this type of climbing was a great test of his skills and a chance to pick up some new ones. 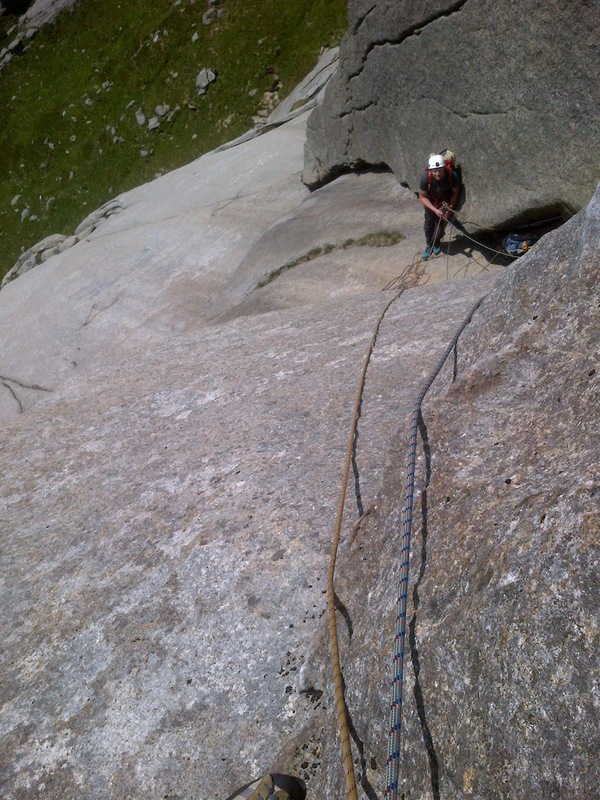 We climbed the classic South Ridge Direct on Cir Mhor, a 330m route with a 3 hour approach, in 12 pitches. And the weather was perfect. Huge sweeps of blank granite split by cracks gave a great variety of climbing. 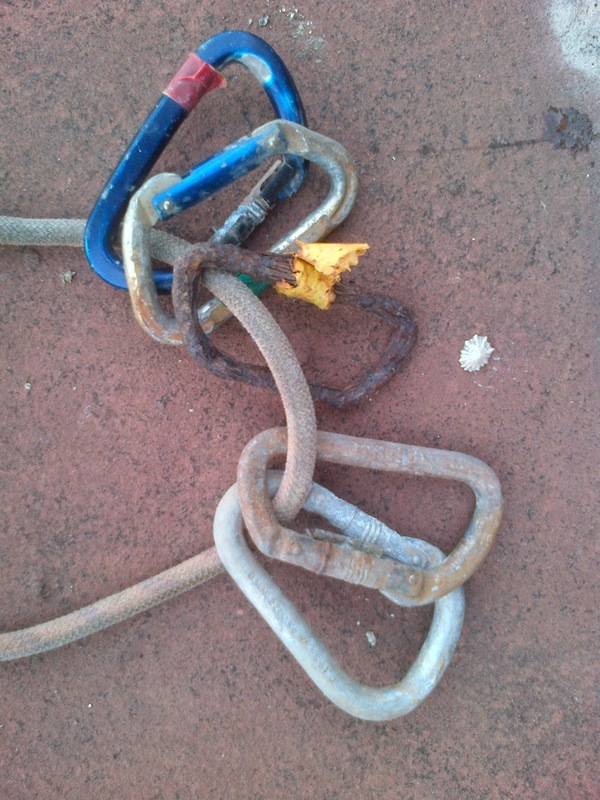 We looked at a number of ways to improve efficiency at belays and changeovers, an important factor on long routes. A 5 minute time saving on every belay makes a big difference on routes like this and can be the difference between becoming benighted or not. With nowhere to hide from the sun its worth keeping covered up. 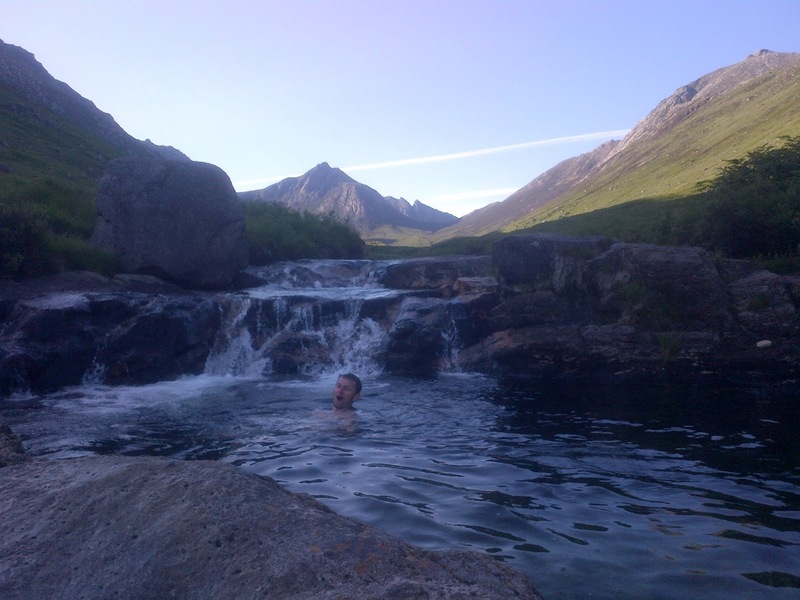 But the river provided the ideal place to cool off afterwards! alpearson. Travel theme. Powered by Blogger.